Over half (54%) of the Americans who are most likely to sign up for health coverage through the new health care exchanges —the uninsured and those who buy their own coverage — would opt for a plan that costs less even if the coverage is narrower, according to a new Kaiser Health Tracking poll released today. Broader plans at a higher cost would be the choice of 34%. The public, taken as a whole, leans the other way, with 51% saying they prefer a plan that costs more money but provides a broader network of providers while 37% would choose a lower-cost option with less choice. 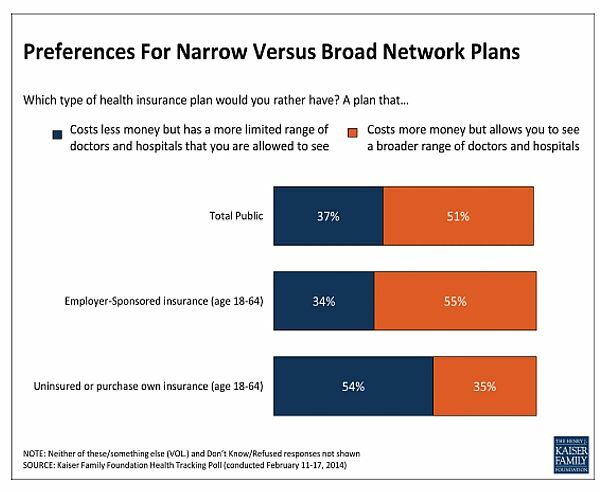 Americans who have employer-provided coverage prefer higher-cost/broader network plans by an even larger margin: 55% to 34%. But Kaiser found some wiggle room in the opinions of those in the higher or lower cost camps. When the 37% of the overall public who said they preferred the lower cost plans were asked if they would still feel the same if they found out they would not be able to visit the doctors or hospitals they usually use, the percentage saying they would stick with that option fell to 23%. On the flip side of the question, when the Americans who said they preferred the more expensive, broader plans were told they could save about 25% on health care costs by going for narrower plans, the share of those choosing the more costly option dropped from 51% to 37%.